Please be advised that this hike is not accessable, because the access road is washed out as of the spring of 2009. The Hike to the Hat Rock Overlook via Snagtooth Ridge trail begins along Forest Road #9341. The trail starts climbing rather modestly, but within a quarter mile it becomes extremely steep. Most of this hike occurs within dense forest with occasional yet outstanding viewpoints. At about 3/4 miles the trail passes over the crest of Snagtooth ridge and there is an outstanding viewpoint for your pleasure. 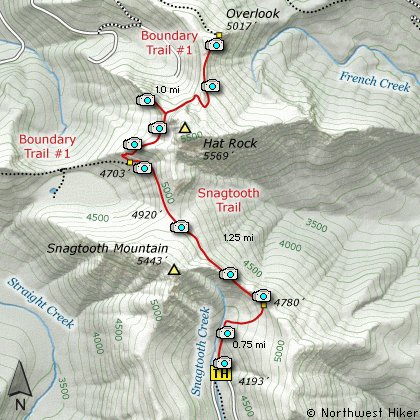 The trail continues to climb vigorously as it makes its way over the northeast side of Snagtooth. There are occasional views of the surrounding Dark Divide and Mt. Adams to the east. At about 2 miles the trail joins the Boundary Trail #1. At this point, turn right and follow Trail #1 uphill along the western flank of Hat Rock. Within a half mile the tail comes out on a large cliffy area which is the goal of this hike. This cliff area provides our standing views to the west. If you hike east along the Boundary Trail for another half mile, you will be treated to outstanding vistas of Mt. Adams, Juniper Ridge, and Mt. Rainier to the north. From the junction of Forest Road 90 and Forest Road 25 at the far eastern end of Swift Creek Reservoir, travel east on FR90, crossing the Lewis River, and heading upstream for about 4 miles. You will come to the junction of the Curely Creek Cutoff Road, which comes from the south and the Wind River Highway. From this junction continue east on FR90 for about another 9 miles and FR90 will cross the Lewis River. In the next several miles you will pass the 3 approaches to the Lewis River Falls, which are hikes on this CD. At about another three and a half miles after the river crossing, you will come to Forest Road 93 on your left. Turn left, or north, onto FR93 and follow it uphill for another 6 miles to the junction of Forest Road 93 and Forest Road 9341. Bear right onto FR9341 and follow it another 4.7 miles to the trailhead for this hike.